Katie and Mike Seeba had planned to celebrate New Year’s Eve at dinner with friends. Instead, the Bennington couple spent it at Methodist Women’s Hospital, becoming parents. 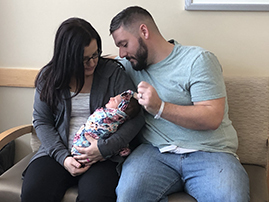 Peyton Jade made a speedy and safe entrance into the world at 12:02 a.m., making her Omaha’s first baby born in the new year. KPTM: Omaha's First Baby of 2019 Born at 12:02 a.m.